Monselice is a medieval town in the Veneto Region, located on the plain at the edge of the Euganean hills. A great place for a day trip, where you’ll be strolling around its cobbled lanes, enjoying the view of its medieval center and castle and taking a walk up to the scenic Colle della Rocca. The castle is made up of different buildings dating back to different eras. The Euganean Hills A bike itinerary that follows a circular route around the perimeter of the Park of the Euganean Hills. The path is paved in most sections and it’s easy. 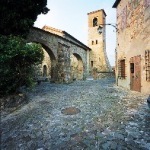 We suggest you to stop in the cosy Arquà Petrarca, the small pebbled village of the poet Petrarca, considered to be one of the most beautiful medieval villages in Italy. Padua is an ancient and distinguished art city. Its history is documented by monuments and artworks of unquestioned value. The XIV Century Scrovegni Chapel with its world famous Giotto frescoes, the Basilica of Sant’Antonio and Prato della Valle, one of the biggest squares of all Europe with its 88.620 square meters. Giotto’s are not the only frescoes in town, art lovers can admire much more in the churches and art galleries. Haderburg Castle and its ancient walls. The castle is not very big and is perched on a rock. It had the burden of hosting famous people throughout its history: Melanchthon, one of the closest aides of Martin Luther in 1551 and the painter Albrecht Dürer. Not to be missed by lovers of archeology and medieval military architecture. Venice This incomparable city is full of secret campos, handsome Gothic palazzos and neighborhood wine bars. San Marco square with its bell tower and its gothic majestic Doge’s Palace, the Grand Canal surrounded by venetian style palaces, the numerous art galleries and boutiques. Venice is simply stunning and completely unique. Murano is a cluster of islands connected by bridges, world-renowned for its glass products. Its glass making industry began in 1291 when the city of Venice moved the glass furnaces and the glass artisans here to avoid the risk of fire to city buildings and also because of the smoke. Burano is a fishing village famous for its lace. In the 16th century, Burano’s lace was the most sought after in Europe. Explore this island with its brightly colored houses, the main feature of the island - certainly the most picturesque of the lagoon islands. Prosecco Wine Hills Visit a wine cellar for a wine tasting and lunch overlooking the hills, ancient Follina Abbey and Castelbrando Castle. Dry, lemony, and bubbling, is Italy’s answer to refreshing, sparkling wine. Created from predominately Prosecco grapes in the northern Veneto region of Italy in the foothills of the Alps, Prosecco is light, affordable, and fun. Traditionally, Prosecco was made as a soft, somewhat sweet wine with just a little fizz, but today’s Proseccos are dry and very bubbly. Sometimes combined with a small amount of Pinot Blanc or Pinot Grigio grapes, Prosecco is made using the Charmat. Straw-colored Prosecco, with its overtones of citrus, melon, lemon, almonds, and honey, is a perfect summer wine. Verona Discover the fascinating city of Romeo & Juliet. The historical and cultural heritage of Verona enchanted painters, poets, travelers and famous characters of all ages. Strolling around the small streets you will be notice an unexpected harmony of panoramic views of different historical ages: traces of the sumptuous Roman origins, the medieval Scaliger knight print, the magnificent Renaissance palaces and the imposing fortification that protects the city. Bolzano & the Dolomites The ex Austro-Hungarian city of Tyrol is surrounded by vineyards, apple orchards, castles and mountains, Bolzano is one of the most charming cities in Italy. Everyone seems to live peacefully, no hurry or chaos. The city is crossed by the Adige river and by green beautiful gardens adorned with colored flowers. A drive along the South Tyrolean Wine Road with stops for exclusive wine tastings!